Looking for a gift for someone who enjoys crochet? Or are you a crocheter and you want to drop a few subtle hints about what you would like as a gift? Here are some ideas for crochet related gifts. We also have news of the latest crochet goodies and crochet book reviews. 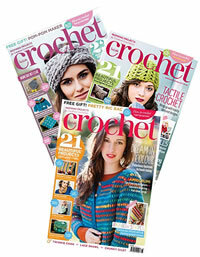 A year's subscription to Inside Crochet magazine would make a great present for any keen crocheter. What I love about this magazine is the range of clothing patterns - really wearable modern crochet patterns. It also includes crochet patterns for homewares, toys and whimsies. 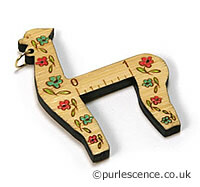 Available from insidecrochet.co.uk and all good newsagents. The must have crochet gadjet of the year is a flower bloom loom. Use as the blooms as an embellishment or incorporate into crochet work. 3 round, 2 square and 1 hexagon loom, yarn needle and central peg for making quarter or half blooms for edges etc. Detailed instructions included. See below for an inspirational book on flower loom blooms. Make blooms with yarn, ribbon or fabric. What I love about this kit is that it has been put together by crochet lovers who want to spread the joy of crochet to those new to the craft. The kit contains good quality, ergonomic hooks and all the other little items you'll need to get started, including a how to crochet guide. Many a new crocheter has been put off by trying to work with cheap and nasty crochet hooks or unsuitable yarn. This kit will get you off to a flying start and provide a basic crochet toolbox for further projects. The lovely packaging makes this an ideal, hassle free gift. These KnitPro ergonomic crochet hooks are a joy to work with. The handles are warm to hold without being heavy. Designed to fit comfortably in the hand they reduce hand strain. They enable you to work for longer without getting muscle cramp. This set comes in a handy pink or lime green storage case and includes a range of 9 popular hook sizes from 2mm to 6mm. 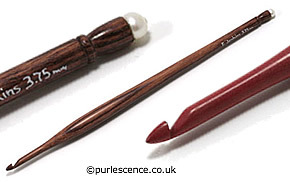 These hardwood crochet hooks are beautifully made. A pleasure to work with and embellished with a freshwater pearl. Choose darker coloured hooks for use with lighter yarns and vice versa. A skein or two of a real luxury yarn makes an ideal present for any crocheter. Look for yarns with 40% or more of the luxury fibre. Luxury fibres include silk, alpaca, camel and cashmere. A merino wool / luxury fibre blend is often a good choice. Hand dyed yarn makes a nice treat too. Try to pick a shade that the crocheter tends to wear. How about some CashSilk lace weight yarn? Ideal for finer crochet, it's 55% silk, 35% cashmere with a lovely luster and comes in a great range of colours. Not sure what to choose? You can also get gift vouchers. This handy little tool makes it easier to compare yarns when making yarn substitutions. It is a great crochet gift because it allows the crocheter to select suitable yarns from the many fabulous 'knitting' yarns that are available. All 30 designs including a chart, written instructions and a large colour photo. 5 project patterns will show you how easy it is to incorporate flower loom blooms into your crochet. Tips on yarn and colour selection plus looming and joining techniques. 'Crochet So Fine' is both a beautiful coffee table book full of inspiring images and a fine collection of stunning but wearable fashion items. Full book review of Crochet So Fine. For any one who loves crochet and Jane Austen, then see our review of Austentatious Crochet: 36 Contemporary Designs from the World of Jane Austen. Crochet bracelet kits are fun gifts for crocheters. They are available in a choice of colours and they aren't expensive, so you could buy a selection of colours. The kits contain the wire, semi-precious stone chips and full illustrated instructions. Just add a crochet hook! ©2012 CrochetBrain.co.uk No part of the content (text or images) may be reproduced in whole or in part without permission. We will pursue all cases of copyright infringement to the full extent of the law and recover quantifiable losses.